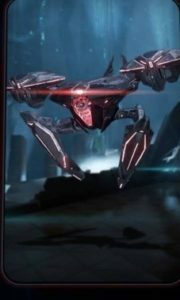 This is a Mass Effect Andromeda enemies article on the Remnant Breacher enemy. Here you’ll find information about an enemy found in Mass Effect Andromeda. These annoying buggers will look for you. They will find you, hiding in the covers from the Observers, and they will tear you a new one. Analysis of Breachers debris shows that their systems are fundamentally unstable: their power cores are improperly shielded and many of their inner workings are exposed. This suggests that they are created for short-term deployment to handle intruders who stray into Remnant territory, and in turn offers some insight into the Remnant builders’ military doctrine. Combined with single-minded programming that focuses on hostiles, the volatile construction of Breachers makes them extremely dangerous. If provoked, the Breacher will launch itself at an opponent and attempt to latch onto it, using exposed gears to grind through hardsuits and cause severe damage. When damage beyond repair, a Breacher may trigger its power core to overload and self-destruct. All quests with alien vaults and assemblers specifically will feature these critters.